Coyote in The Netherlands On October 19, 2010 I moved from the US to The Netherlands. This is a love story many years in the making. 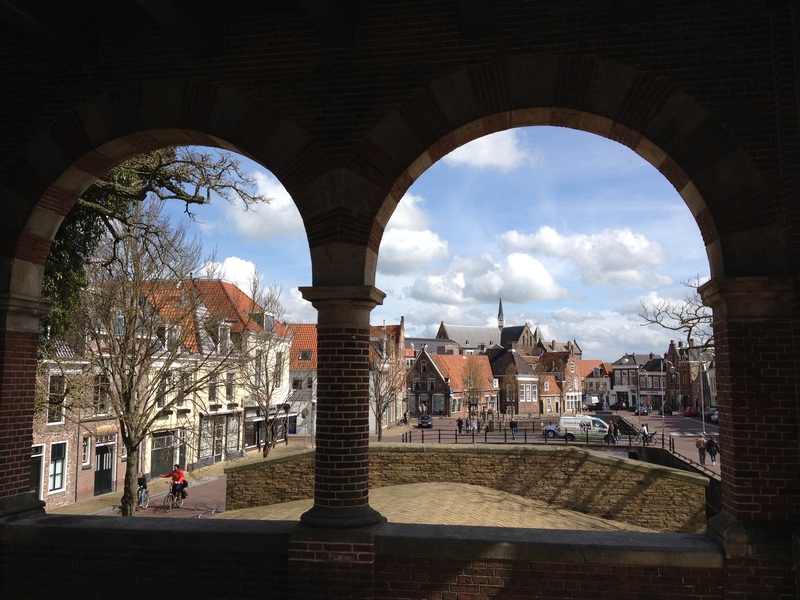 Weird Dutch Town Names Tour #2 – Sneek! 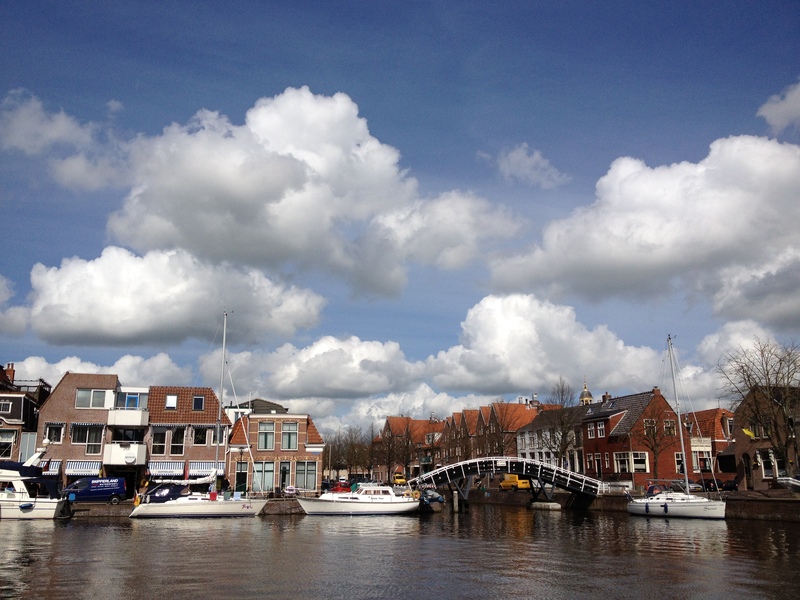 We woke up this morning and saw…sunshine! On a weekend day! This never happens. I quickly looked at the forecast for Sunday and the rest of the week, and it’s dismal: rain and no warmer than 13C (48F). Well! That decided things in a hurry. Road trip! 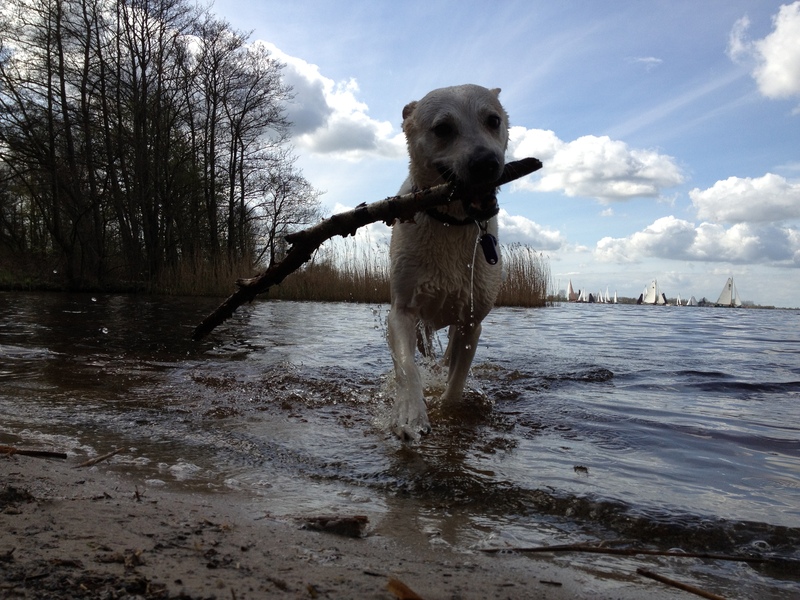 Carel suggested Sneek, It’s on my list, so we packed up the dog, who is always up for an adventure, and headed out. 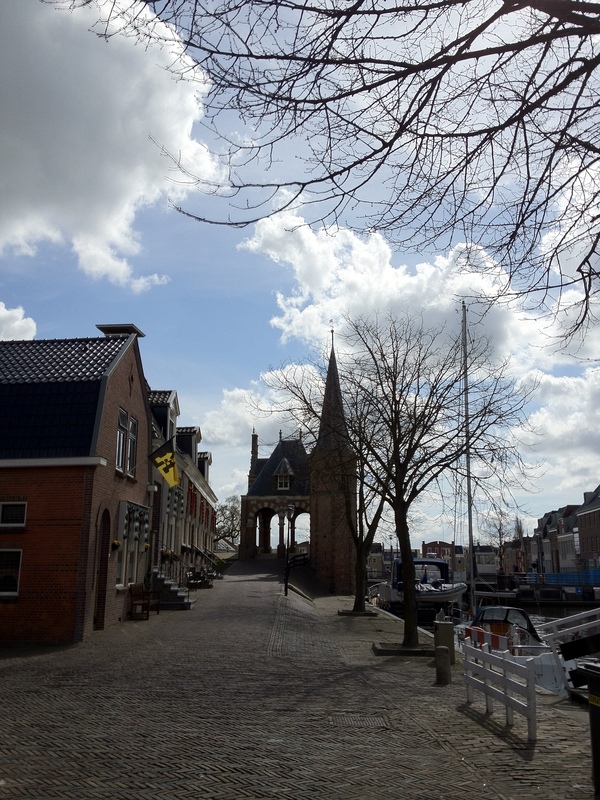 Sneek is in Fryslan (Friesland) and is one of the 11 cities that make up the Elfstedentocht course. It’s been a city for a long, long time – it got city rights in 1456, and was critical for the shipping trade in its heyday. Now it’s the site many popular sailing races, and a center for water-centered-sport of all kinds. Also, as we found out, a major shopping center. Sneek, also known as Snits, hee!! here we come! It’s about an hour away, like everything else in the Netherlands. 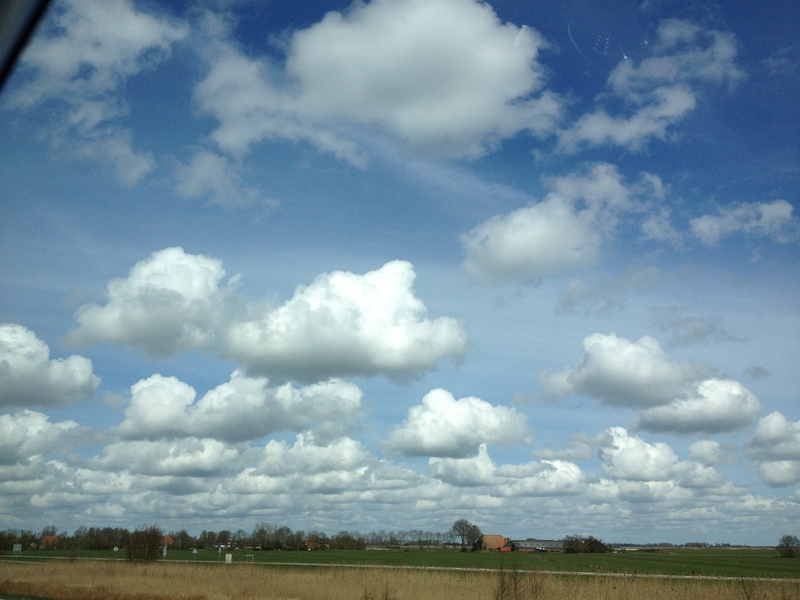 It was a really pretty drive, all lush countryside, horses, cows, sheep and wide, wide Dutch skies. They call these clouds “stapelwolken” – stacked clouds, because, well…they are! We forgot to stop and take a photo of the town’s sign, so you’ll just have to take my word that someone would name a town Snits. We stopped outside the city center and found a place to park, just in front of a “coffee shop” called Heaven. Directly across the street from where we left the car is the Waterpoort, or Watergate. I found some stairs leading down to a small walkway right along the side of the bridge at water level so I went down, and as we were taking these photos*, the bridge started to go up. 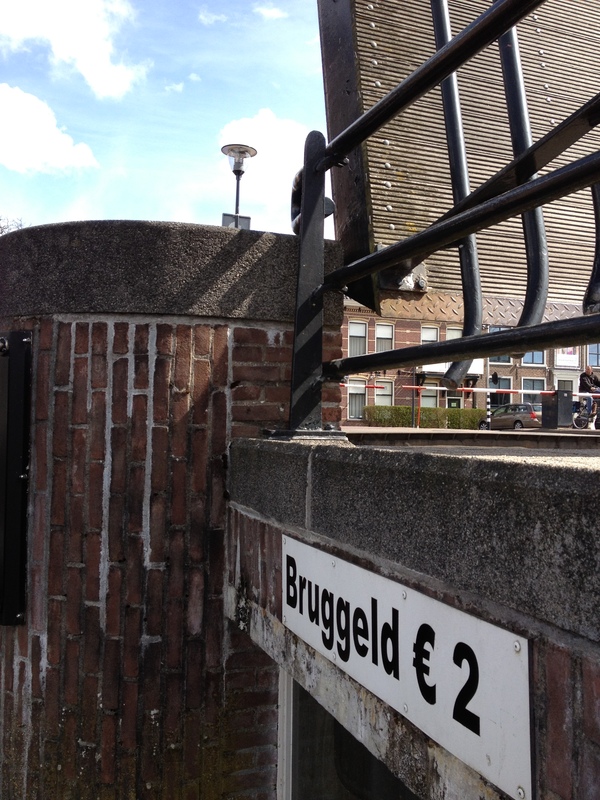 Apparently it costs 2 Euro to have them raise the bridge for you. How that money is collected here is a mystery to me, but Carel tells me that some bridge-keepers use a fishing pole with a wooden shoe hung from it to reach out to the boats and gather their tolls. I’m not sure if he was pulling my leg or not. [Editor’s note: Carel swears it’s true and showed me a photo to back it up] That vertical on the top right is half of the bridge, wide open to allow the boat to pass. 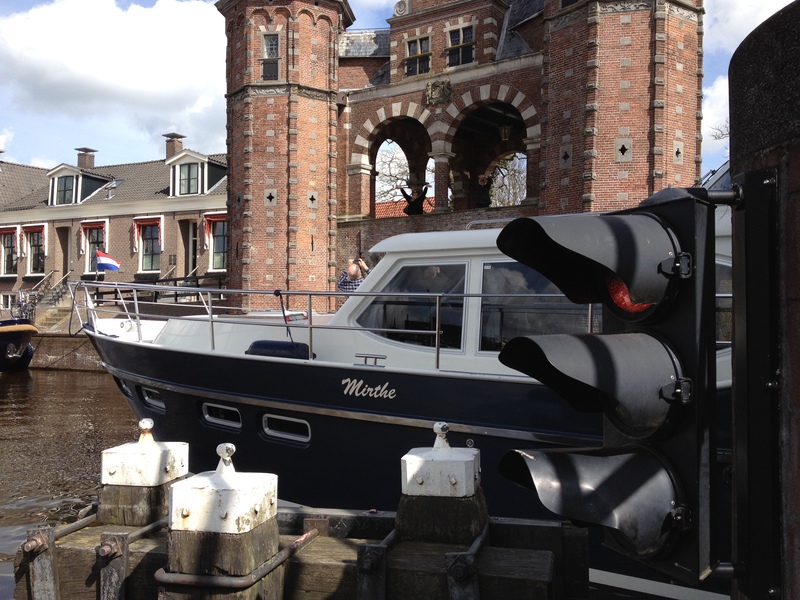 It was a rather jarring sight, this great big modern motor boat with the ancient Waterpoort behind it! After this behemoth passed, we went back up and crossed the bridge and headed toward the town center to see what there was to see. 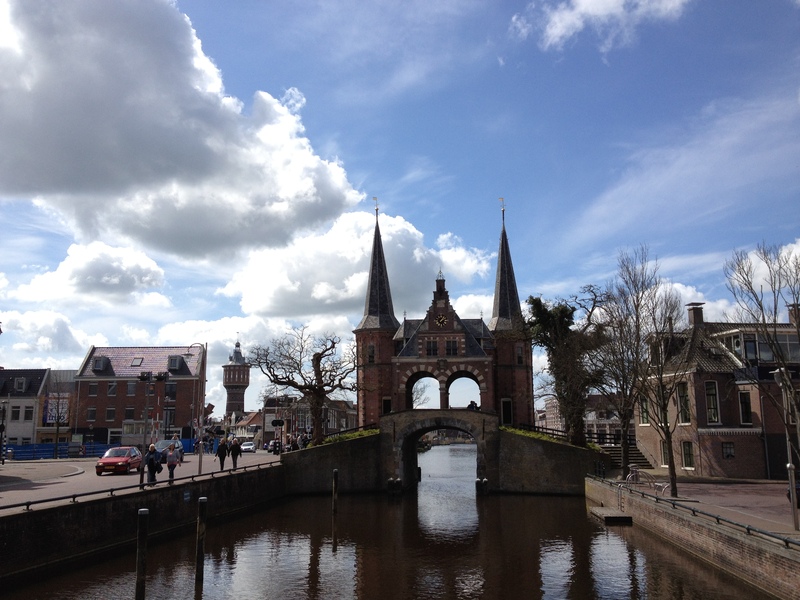 I took a photo from the middle of the Waterpoort. 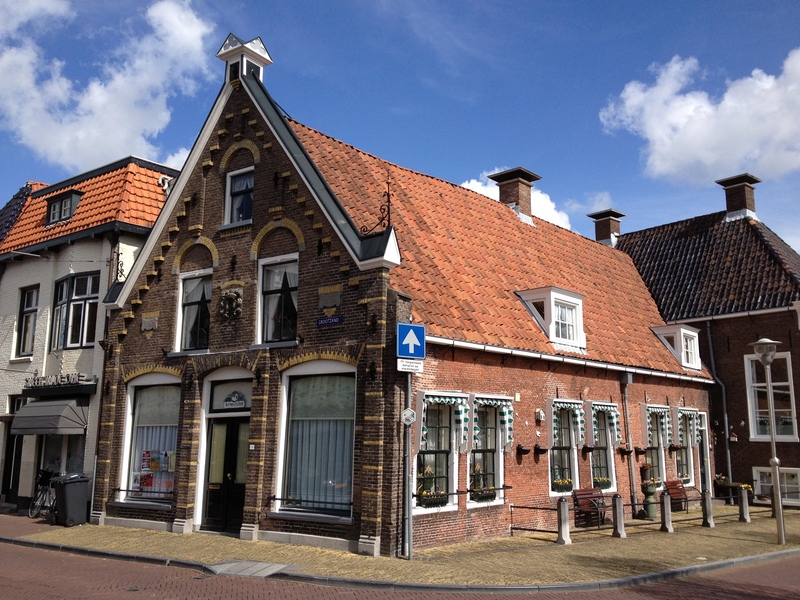 We passed by a set of herenhuizen (gentleman’s houses) that had what I am told is some very old-fashioned brickwork. I was lucky enough to find some of it right alongside a more modern house, so I can show you the difference. On the left is the modern type, which is nice and sensible and normal looking: bricks with mortar in between and slightly sunken. On the right is the older way of doing it, and for the life of me I don’t understand how it is done. The mortar extends above the brick and the surface is smoothed flat. How do they do that without getting the stuff all over the bricks? It must cost a fortune to have that restored today. 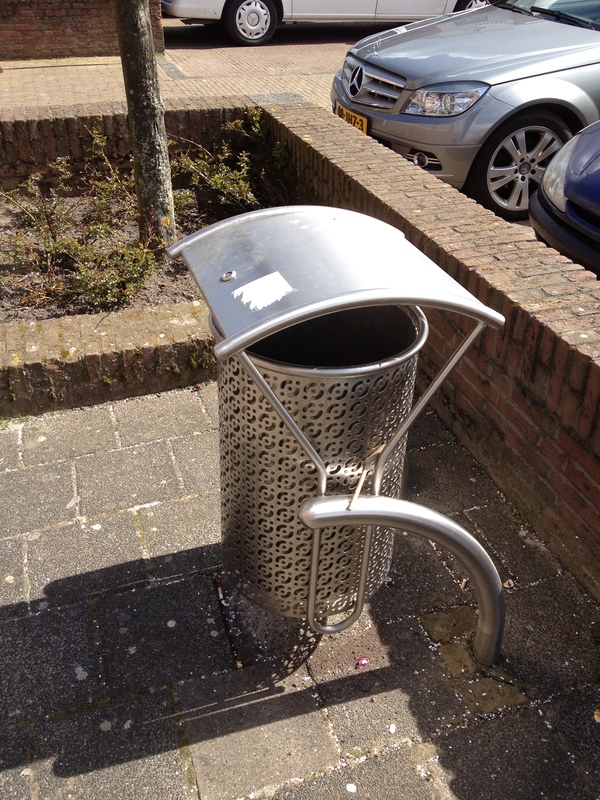 On our way downtown I noticed that even the trashcans here have little hats to keep the rain out! 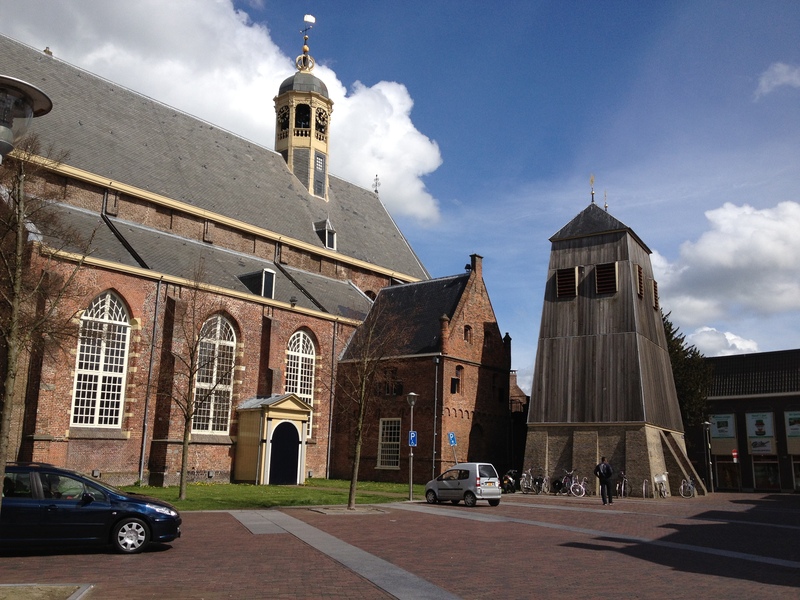 We came up alongside the church and noticed an odd structure, built all of weird angles and…well, somehow very Dutch looking to me. It is apparently a bell tower, restored in the 1800s and again in the 1960s. Standing right next to it and looking back at the church was dizzying, all the angles and verticals. It really looks like I’m holding the camera in a tilt, but the bikes prove I wasn’t. Strange! We were hungry and needed a break so we stopped at a cafe’ that had outdoor seating to accommodate the dog, and settled in for some people watching accompanied by hot chocolate (met slagroom, of course!) and a snack. 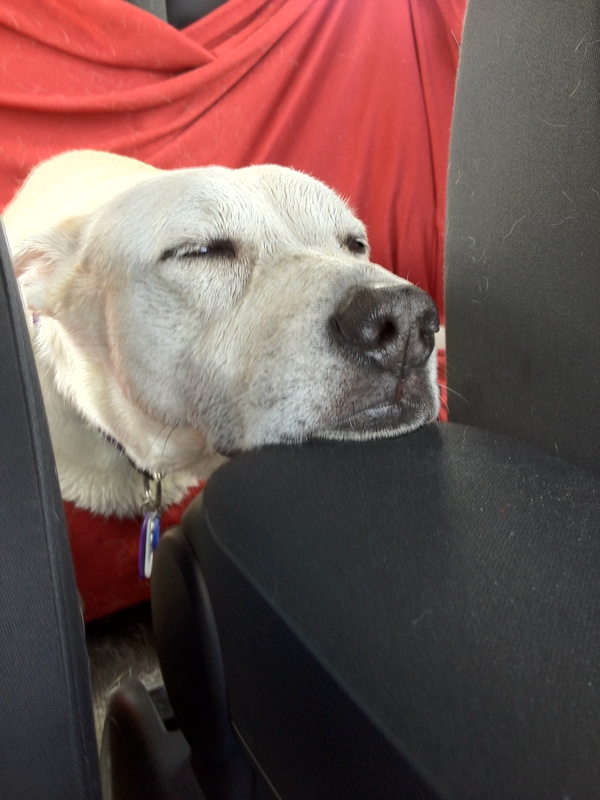 Carel had a ragoutbroodje that smelled wonderful and attracted the dog’s enraptured attention. 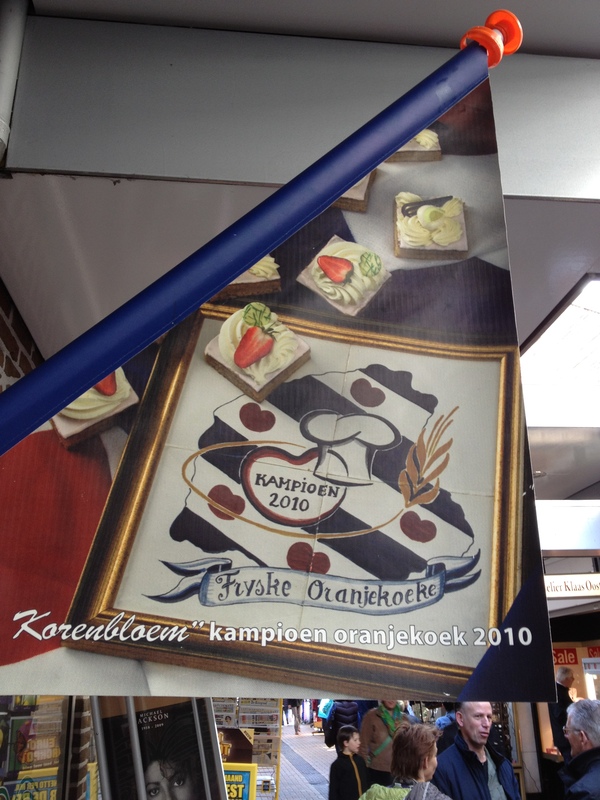 I chose to sample the dessert that the bakery had won an award for in 2010 – a piece of oranjekoek (orange cookie). I had to look it up, and found out that it was originally a Frisian wedding sweet. It’s a sort of gingerbread with a layer of marzipan in the middle, with a thin layer of pink icing on the top. Why it’s pink and not orange as the name suggests it should be, is a mystery. If you want to try and make your own, someone posted a recipe. It was very good. I’d have it again without hesitation. We went on and found that the center of the town was a whole lot bigger than we had anticipated. It was a sea of people and endless retail stores, ranging from well-known large clothing brands to small flower shops and everything in between, criss-crossed with canals lined with market stalls selling food and snacks; the dog inspected every passerby to make sure they didn’t have food for her. She’s a funny creature. I saw her look up directly at a man holding a phone in front of him, zero in on what he was holding – “Oh. Not food, too bad!” – and she shrugged and moved on. To think people believe dogs can’t talk! 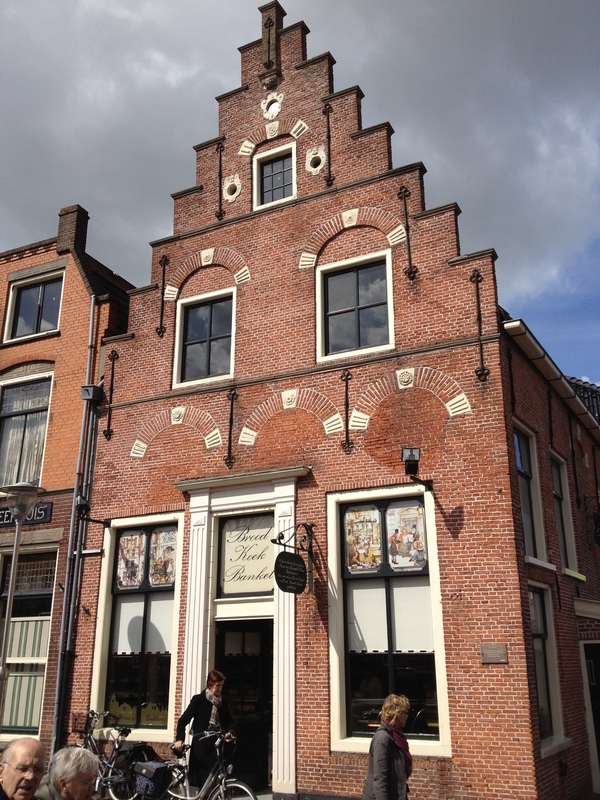 Mixed in with all the capitalism were some nice examples of classic Dutch architecture, too. This kind of building is called a “trapgevel” (stairway house). 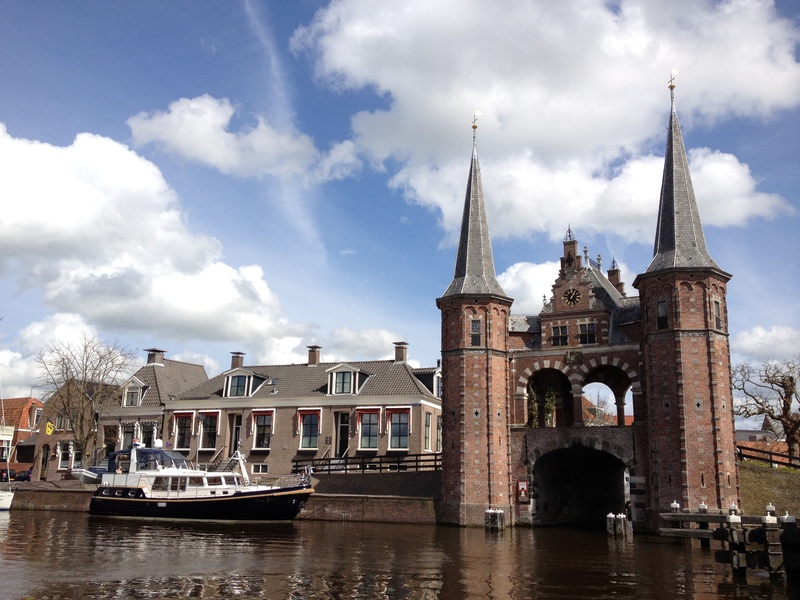 As we went back to the car I got a really nice shot of the Waterpoort up the canal from us, with a wonderfully dramatic Dutch sky as a backdrop. That was it for Sneek. It was only 2PM, though, and we were not ready to call it a day yet. We thought we’d try and find someplace to let the dog out and have a run, and as we were driving along Carel noticed a sign which announced that a specific boat-race he’d told me about on the way down was happening this weekend! 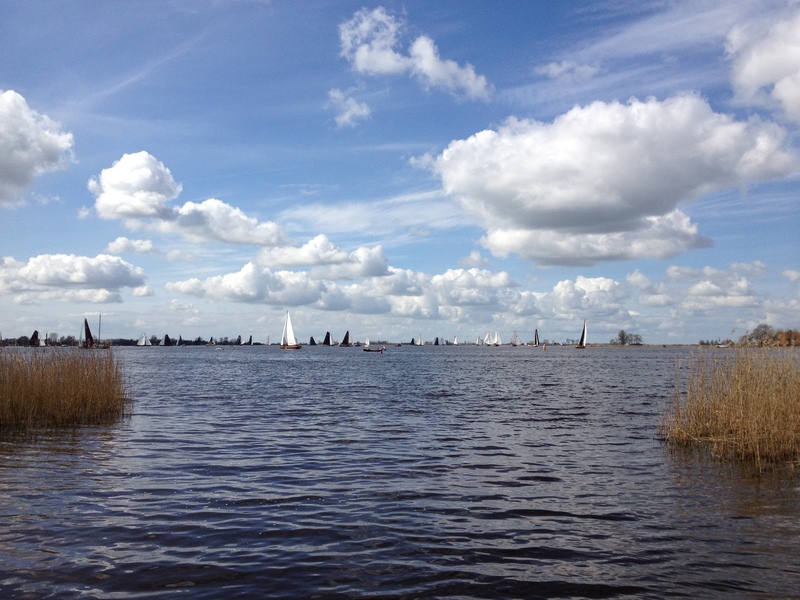 Sure enough there was a teeming mass of sails over yonder, so we found a way to go park next to the lake and have a look. 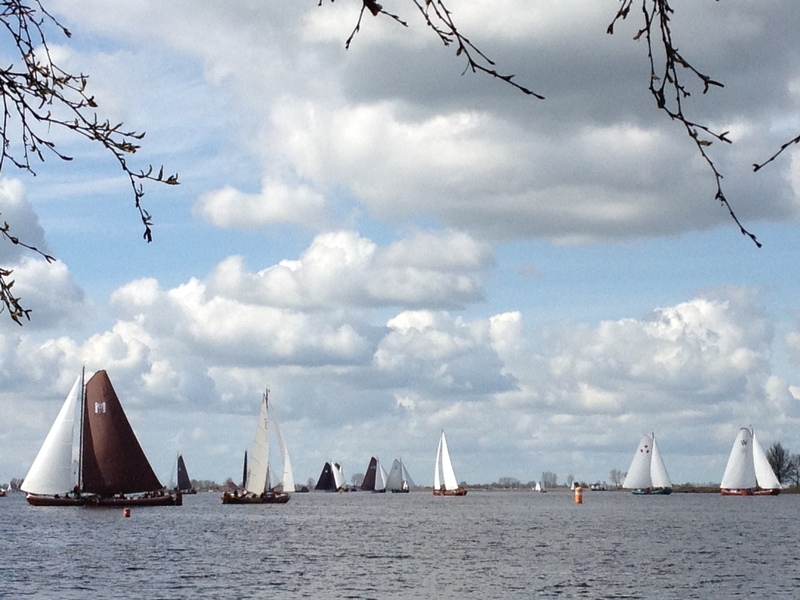 This race was just a practice skûtsjesilen, but who cared? 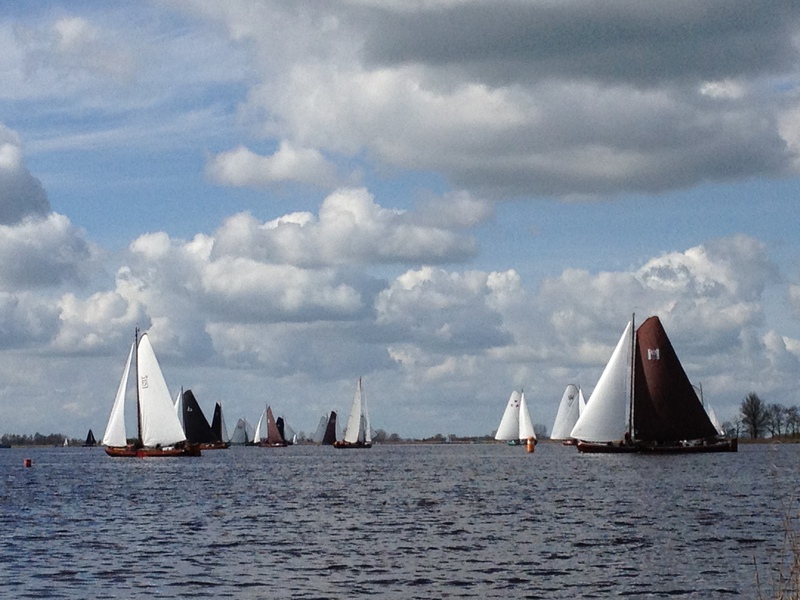 The old fashioned boats looked lovely, and watching them maneuver around made me think wistfully of my father. He loved sailboats, and I wish so much I could share this with him. 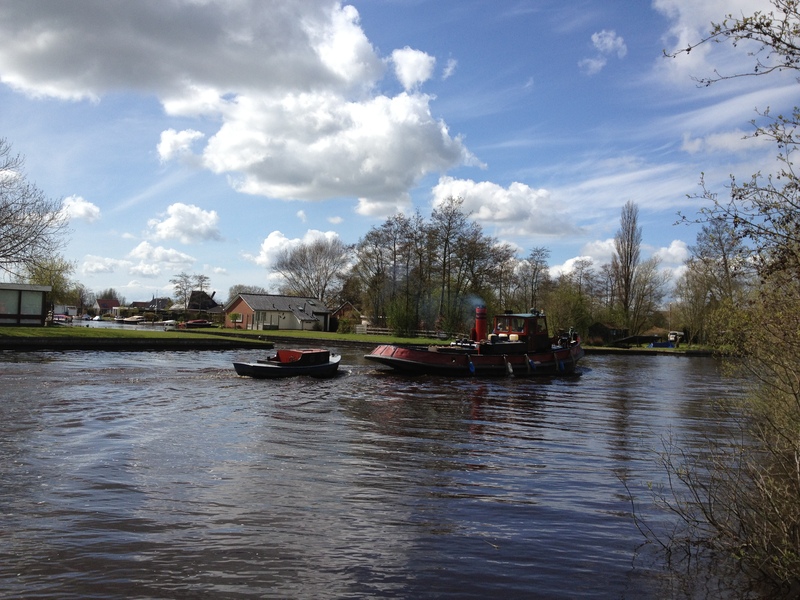 These grand old ladies were once just cargo boats, but have been preserved and loved, and now they are one of the prides of Friesland. 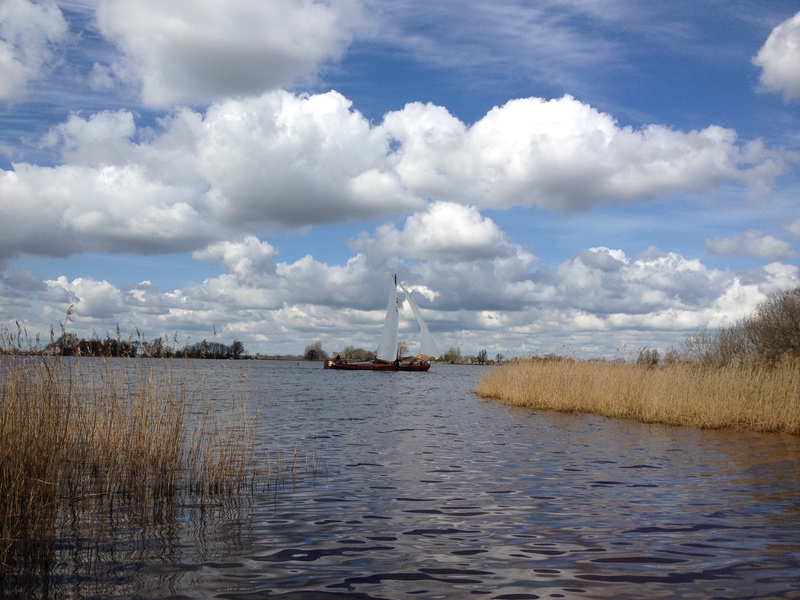 We also saw this gorgeous old boat, towing a tiny little boat behind it. I swear it looked like a mama duck with a duckling following her. 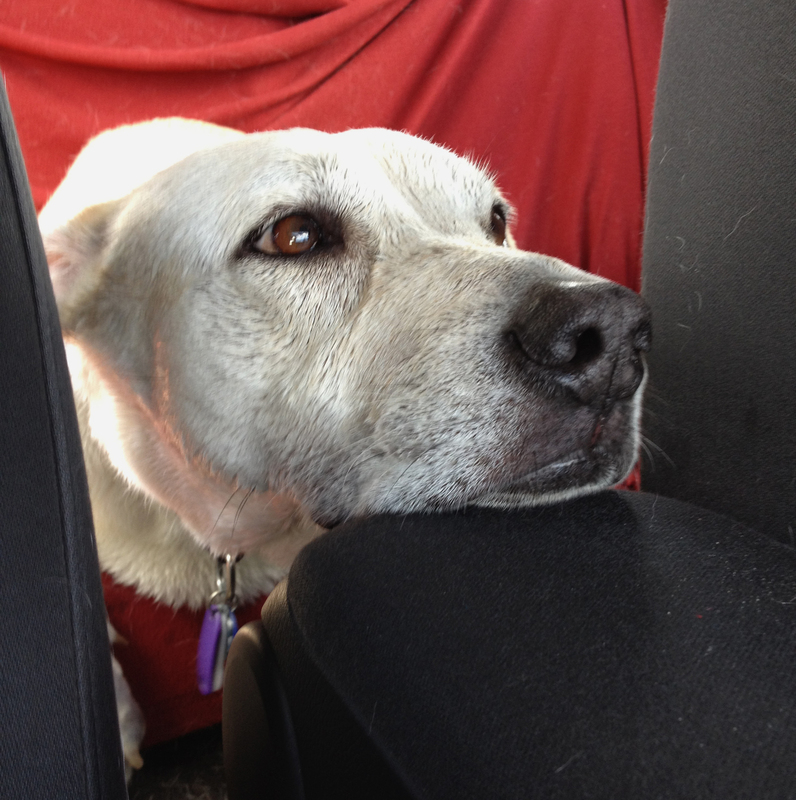 We walked along the bike path, letting the dog run free. There were quite a few other dogs there, including a 9 month old Rottweiler puppy that Daisy played with happily. That dog and another young black dog of uncertain lineage were chasing sticks into the water, and she watched them intently. After they left, she indicated she might be interested in trying this new game. 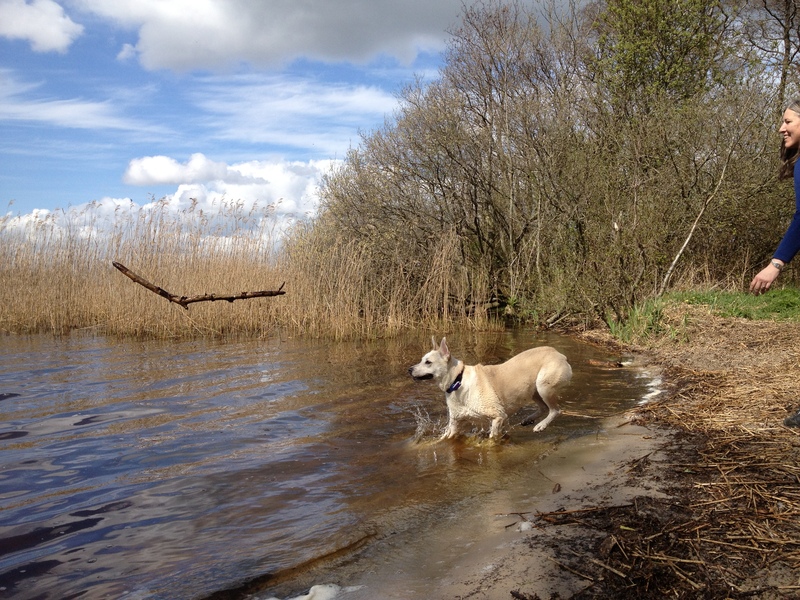 …so I started throwing a stick a short way into the water. I like this photo; how everything in it is moving forward at once! Stick in flight! This is where I stop to express my astonishment that this kind of photo can be taken by a telephone. WOW. Click on it. 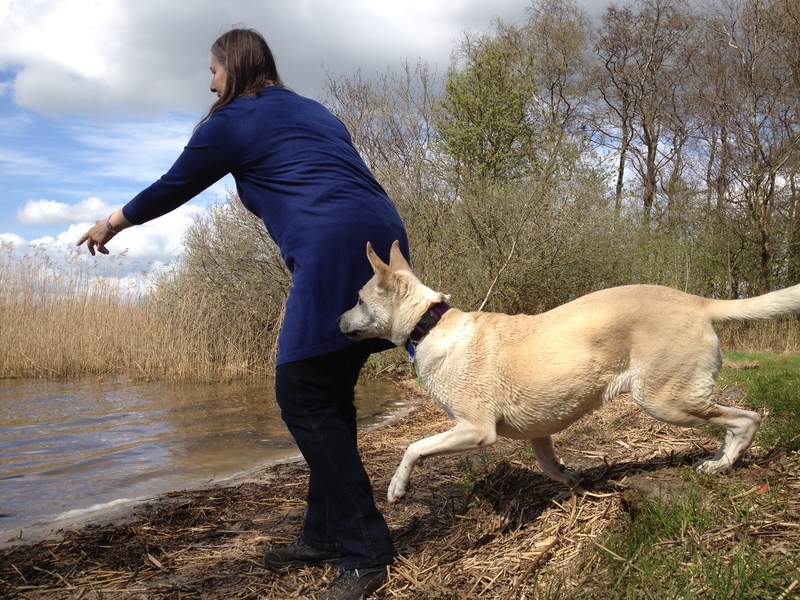 Look how everything is in focus, from my face to the dog’s body and the stick hanging in mid-air. 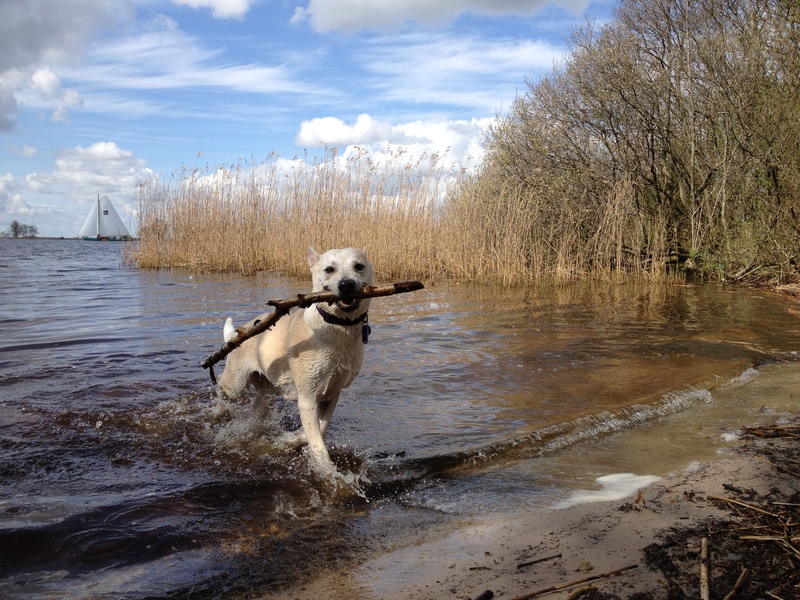 This new game was received with much enthusiasm, even if she did get confused by the water hiding the smell of the stick. She’d wander around poking her head underwater looking for it, and would usually find it by bumping into it, but hey. It was her first try and she’s allowed some slack. She was awfully pleased with herself, and rightly so. She’s afraid of water, so this is big progress for her. Another “Wow, my phone is amazing” comment – if you click on the next two photos, the detail is truly amazing. It even keeps the water drooling out of her mouth in focus. This is a great shot taken by Carel! I love it. Everything is so clear (thanks, iPhone 4Gs! 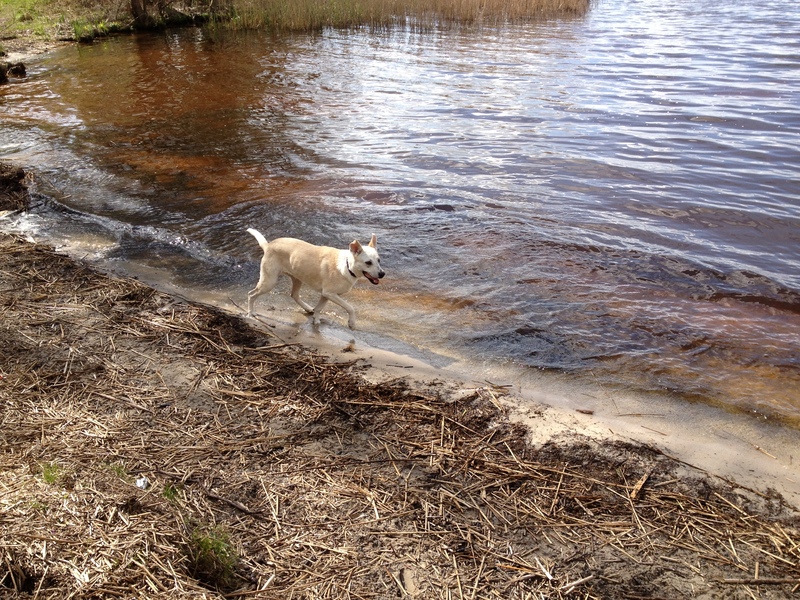 ), even the water splashing around her paws. She is just beaming with pride, striding out of the water like she’d been doing this all her life and there’s even a conveniently placed boat in the background for a touch of Dutch. Awesome! Some time later we were all tired, the dog was sopping wet and very happy, and I had a stew to make so we went back to the car, realized sadly that we didn’t have a towel for the dog, yuck! and drove home. *I feel compelled to note that all these photos are straight off my phone. I haven’t edited them at all. Yay, amazing camera quality on a phone. Boo, not making them perfect. This entry was posted on April 14, 2012 by Coyote. It was filed under Uncategorized . Superb. Seeing the Netherlands through a non Dutchy again is like rebirth. Thanks Anna. That’s just exactly the kind of comment I like to get. You’re welcome, Arjen! I’m having a lot of fun getting the material for these posts. P.S. I have a couple of pics of Spankeren if you need them. Enter your email address to subscribe to this blog and receive notifications of new posts by email. I will never, ever spam you. I'd sooner eat horsemeat. 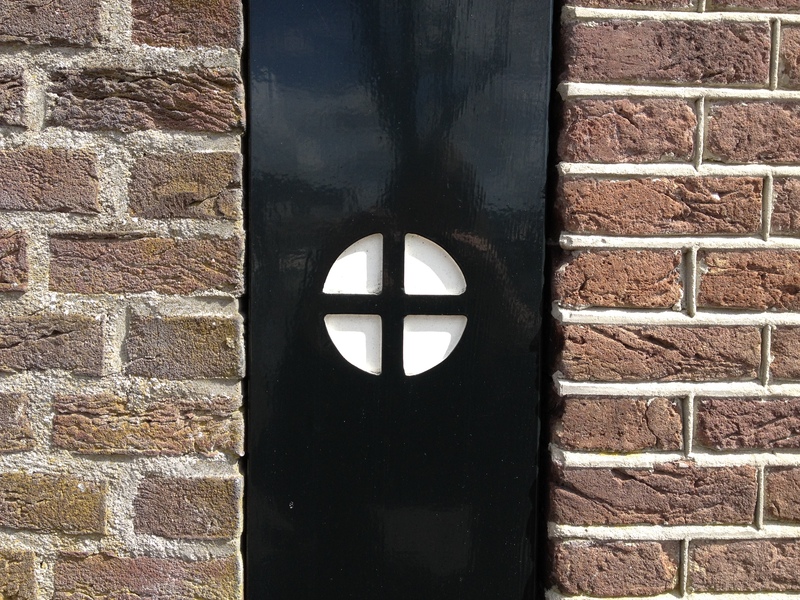 Schiermonnikoog – mooiste plek in Nederland! Honden en Recepten! 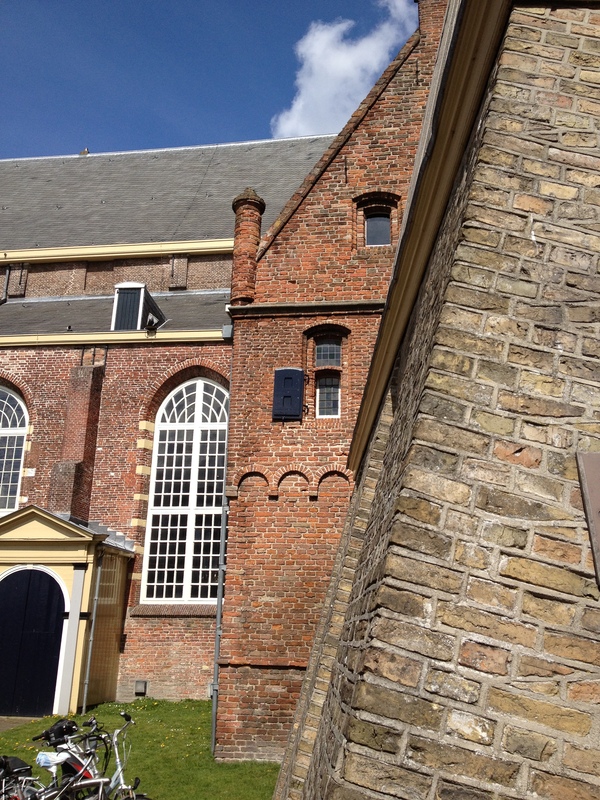 Lam Stoofpot, Maastricht stijl. 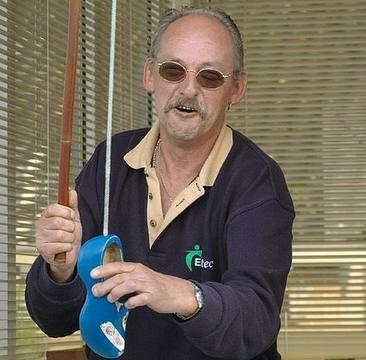 Heel lekker! (An aside) Recepten! Wild hertenragout!